With A1 portable Bluetooth Speaker, music lovers can now hold decades of Bang & Olufsen sound technology and experience in the palm of their hand. 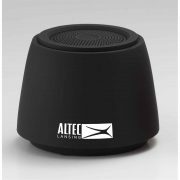 This ultra-portable wireless speaker delivers crisp ambient sound in a compact 1.3 lb (600 g) package. Grab it and go wherever life takes you; it charges in approximately 2.5 hours and provides up to 24 hours of battery life per charge. Created by award-winning designer Cecilie Manz, this mini audio powerhouse looks as good as it sounds: a smooth dust- and splash-resistant aluminum dome, double-molded polymer base and rugged leather strap balance cool sophistication with warm accents for a unique tactile experience. The convenient Connect button allows you to pick up where you left off, activating your last played music at launch. Users can also take advantage of intuitive ToneTouch technology via the Beoplay app to personalize their listening experience, set up wireless stereo pairing and update products with the latest software. Not just a music speaker, the A1 also lets you make calls on the go with a multi-directional microphone that increases voice recognition for everyone on the call. 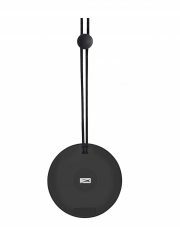 Lightweight but powerful, the sleek A1 delivers signature Bang & Olufsen sound quality when and where you want it.